This disgusting 72-inch tall animated Twitching Ghoul looks to have just shambled off a battleground from the middle ages! 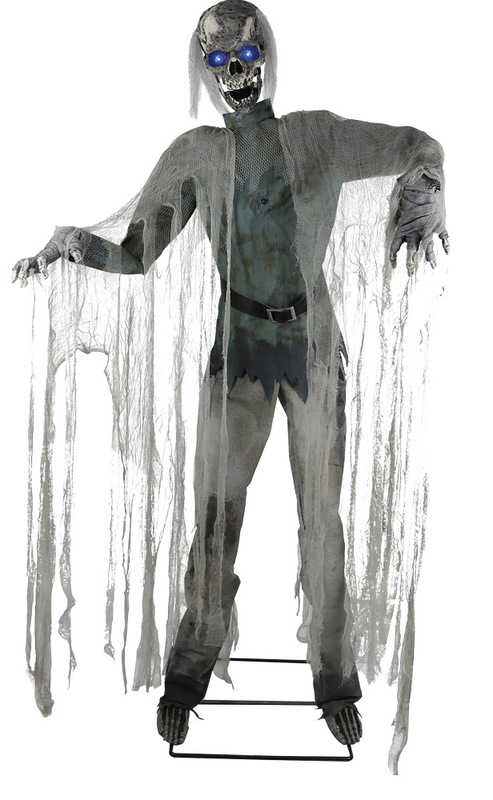 Wearing a tattered costume with shredded-gauze accents, this rotting Ghoul will rotate at the waist in a jerking motion that will cause his disturbingly-realistic plastic hands, chest, and spring-activated head with a loose jaw to twitch and flop around. His eyes light-up with an other-worldly blue color while he makes disgusting sounds of the undead - truly horrifying! Plug the UL power adapter into any standard outlet and choose from Steady-On, Infra-Red Sensor or Step-Here Pad (included) activation options to operate. The infra-red sensor works up to 6.5 feet away and works in all lighting conditions - bright light to no light! Item includes volume control. Easy-to-assemble quick-connect poles. Assembly is required. For indoor or covered-porch use only.